Description: The 1804 does some switching in the NYS&W yard at Saddle Brook. Description: The 1804 cuts off from the train to do a bit of switching. Description: GP18 1804 crosses the Overpeck Creek drawbridge. Description: A pair of lite engines cross Overpeck Creek. Description: The local freight is on its way out for the days work. Description: The 1804 is in charge of the Northbound local. The River Line tracks are in the foreground. Description: GP18 # 1804 is at the head of the Westbound local to Paterson. Description: The local freight heads back to the yard at the end of the day's work. Description: The 1804 sits inside the old engine house at Little Ferry. Description: Crew shuttle to & from shops. Description: Shuttle heads back to the shops. Description: Built by EMD in August of 1962 for the New York, Susquehanna & Western line, it eventually was sold to the shortline, Penn Eastern Rail Lines as their PRL #1804. Unknown photographer and location. The slide comes from the Houser collection. 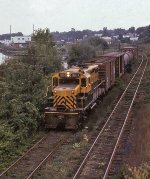 Description: Viewed from the Mirrer Trucking transloading facility next to Passaic Junction Yard, where Suzy-Q GP18 #1804 is coupled mid train on an eastbound local. The building in the background is Sealed Air, the makers of bubble wrap - who hasn't spent hours popping their product? They were/are- a Suzy-Q customer for plastic pellets. You can see the front of this train here -- http://knox.rrpicturearchives.net/showPicture.aspx?id=1040807. Description: I was over in Jersey one Saturday and caught this completely by chance. The crossing gates seemed to be out of service, notice the crewman flagging the street crossing. Theres a bonus for the fire apparatus guys too!! Description: The WS local approaches Ridgefield Park on its last leg into Little Ferry. Description: 1804 is hooked up to a tie train sitting on the curve at Stockholm. Description: The NYSW local approaches Hawthorne, crossing this low bridge, making the train look three sizes too large. Description: Despite having taken on international stack trains, some of the track on the NYSW was not exactly high speed at this time. This local is not setting speed records as it rolls through Paterson. Description: NYSW 1804 plods through the snow as it works its train at Passaic Jct yard. NYSW fans will recognize the round Travelers Inn adjacent to the yard. Description: The power from an SLN 5 that came into town in the morning is now at the shop awaiting attention before it goes back to Jersey on the next eastbound. NYSW ran anything that would pull cars on those trains, as can be seen by the lineup here. Description: NYSW 1804 sits out of service with some passenger cars in the Binghamton yard. It will eventually be rebuilt and returned to service with a new variation on the yellowjacket scheme. Description: A shot of this unit several months earlier showed it in the yard, missing its pilot. The shop has given it some attention, and it is now ready to go back on the road. Description: A view of the south end of the shop at East Binghamton gets a view of an NYSW GP18 and a D&H C 424. Youd be hard pressed to match that scene anywhere else. Description: SLN 4 rolls into Port Jervis behind, of all things, a GP 18. It now has to tackle the grade over Otisville, and the up and down of the NYSW. Almost home.